2006 AVATAR. Toronto: The Mercury Press. Poetry, 96 pages. Editor: Beverly Daurio. ISBN: 1-55128-121-X. ‘Pataphysics is a fictional science: the science of imaginary solutions. 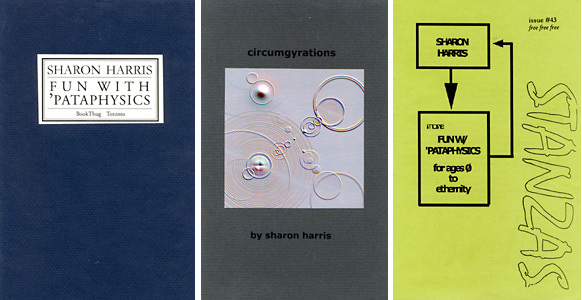 Sharon Harris proposes a problem for poetry to solve: how to unfold a book if the book is a lotus; how to unfold a word at the centre of that book? AVATAR is a word that is commonly heard but rarely understood. AVATAR (in virtual reality) is an icon representing a person online. AVATAR is the bodily manifestation of a God in Hinduism. AVATAR is a little like dancing with a cartoon after it shimmies off screen. AVATAR is an Abstract Visual Asymmetric Technology Apperception Resource. AVATAR is writer and photographer Sharon Harris’s first collection of poetry. 2013 The Broadview Introduction to Literature. Eds. Lisa Chalykoff, Neta Gordon, Paul Lumsden. Calgary: Broadview Press. 2013 Ground Rules: the best of the second decade of above/ground press 2003-2013. Ed. rob mclennan. Ottawa: Chaudiere. 2012 The Last Vispo. Eds. Crag Hill, Nico Vassilakis. Seattle: Fantagraphics. 2009 poem, home: An Anthology of Ars Poetica. Eds. Jennifer Hill and Dan Waber. Kingston, PA: Paper Kite Press. 2007 Not for Mothers Only: Contemporary Poems on Child-Getting & Child-Rearing. Eds. Catherine Wagner and Rebecca Wolff. Albany, NY: Fence Books. 2005 Shift & Switch: New Canadian Poetry. Eds. derek beaulieu, Jason Christie, a. rawlings. Toronto: The Mercury Press. Globe and Mail review, “Let’s Get ‘Pataphysical” by Christian Bök. “This poet is having fun with language and you know what, so is this reader.” – Reading Children’s Books, 2011. 2014 “Like.” Ottawa: above/ground press. Eds. Christine McNair, rob mclennan. Poetry. 2006 “More Fun With ‘Pataphysics.” Ottawa: Stanzas #43. Editor: rob mclennan. Poetry. 2006 “Circumgyrations.” St. Catharines: In Case of Emergency Press. Editors: Clelia Scala, Tim Conley. Poetry. 2004 “Fun With ‘Pataphysics.” Toronto: Bookthug. Editor: Jay MillAR. Poetry. CBRA (October 2009) by Douglas Barbour. University of Toronto Quarterly (Winter 2008) by Malcolm Woodland. ARC Poetry Magazine (Winter 2008) by Alessandro Porco. Prairie Fire Magazine (Fall 2008) by Melanie Matheson. Lucid Forge (December, 2007) by Kindah Mardem Bey. Matrix Magazine (November 2007) by Jenny Sampirisi. Lemonhound (July 2007) by Sina Queyras. Broken Pencil (May 2007) by Vincent Ponka.